Cockatiels are among the sweetest of all the bird species. 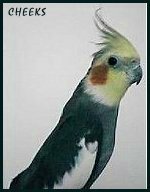 Their gentle nature and outgoing personalities make them wonderful candidates for a "first bird". 'Tiels come in a variety of beautiful mutations. Cheeks, Tommy and Bitsy are "normal greys"... meaning they are the color you would normally see in the wild. The female greys are duller in color with less yellow on the face and duller orange cheek patches. They typically have bars on the underside of the tail and white "dots" on the underside of the wing extending from body to wing tip. Males lack the yellow tail barring and the dots extend only one half the length of the wing. The bars and dots are difficult, if not impossible, to see on certain mutations. As a rule, the males are more vocal than females and can learn to say simple words/phrases. They are usually pretty good whistlers, sometimes learning to whistle entire songs. Males and females make equally good pets. 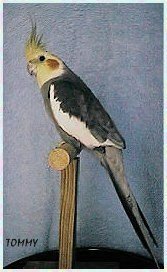 Cockatiels can live up to 25 years with proper care and diet. 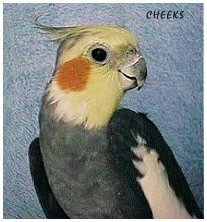 CHEEKS, the cockatiel came to live with me in March of 1990 when he was two years old. Being the first bird I ever owned, he is the inspiration for my love of all birds. Though time has inflicted a minor arthritic crippling of his left foot, he still gets around quite well and is still a chick at heart. 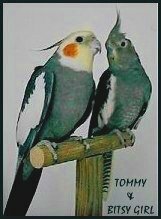 Cheeks shares his large cage with "BITSY GIRL" (hatched: 1986) and "TOMMY" (hatched: 1980). 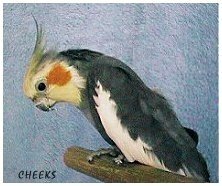 All three "Senior Psittacine" 'Tiels were given to me when their previous owners no longer wanted to care for them- Bitsy in 1991 and Tommy in 1995. Cockatiels are very sociable birds and, except for the occasional minor spat, these three sassy little characters get along very well together. I hope to have them share my life for many more years to come! 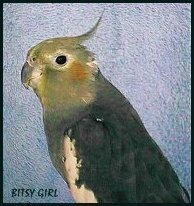 - Bitsy passed away peacefully on Feb. 19, 2001 as I held her close to my heart.